Since 1889, the Eiffel Tower, symbol of Paris, has sparked the imagination of people across the globe. Similar towers have sprouted in at least twenty countries including England, Germany, Latvia, Japan, Brazil, and Guatemala. Taiwan boasts a bamboo tower and Poland a tower of wood. Reproductions to scale are to be found in Belgium, Bulgaria, Russia, the United Arab Emirate, Malaysia, and China. Replicas in American cities sometimes led to friendly rivalry for predominance in tallness and renown. On other occasions, through the vision of community leaders, they brought American cities together. Among the more than 200,000,000 visitors to the original Eiffel Tower was a young man from Medford, Oregon. Steven Gifford sent his parents a picture postcard of the structure in 1980, thereby inspiring his father, a retired lumberman, to construct a replica. The iconic structure stands 1063 feet high, roughly equivalent to an eighty-one story building. Herbert Gifford labored two years to fashion a forty-one foot wooden replica to scale, made of pine and Douglas fir. Disappointingly, the city of Medford refused his offer to donate it for a park. Unlike the replica, Gifford’s previous work was embraced by the city. Inspired during his travels by the ubiquitousness of gazebos in New England towns, he built a gazebo for a Medford park. He also built a replacement for an old concrete bandstand. However, this time the city refused for fear of liability. For more than eight years, the results of his labor stood in the backyard of his white, two-story home at 840 West 14th Street. When Medford declined his offer, Gifford’s tower found a home in a Paris namesake in the northeastern corner of Texas. In terms of population, the city of 26,000 was the second largest Paris in the world. A 1984 movie, Paris, Texas, added name recognition although it showed no footage in that location. An Eiffel Tower was just perfect for the town, to boost civic pride. This is how the transfer came about according to Linda Su Suarez Knox of the Lamar County Chamber of Commerce. She recalled: “I received a phone call from Mr. Gifford stating that he would like to donate the tower to our city if we could arrange for having it shipped here. The Campbell Soup carrier at the time donated the truck and driver and brought it back to Paris, Texas.” The tower had traveled 2109 miles from its original home. Erected on the campus of Paris Junior College, corner of Jefferson Road and South Collegiate Drive, it stood for several months. That was long enough for an official dedication ceremony on Bastille Day, July 14, 1990, at which Mr. Gifford was honored with a plaque. Suarez credits Herb Gifford’s tower as “impetus for constructing another one, more durable, made of metal piping and embedded in concrete so that no wind or fire can destroy it.” The new tower was built by the Boiler Makers Local #902 out of scrap materials at the Babcock & Wilcox boiler plant. Located on the East edge of town on US82, corner of Jefferson Road and South Collegiate Drive, next to the Love Civic Center, the tower is a magnet for visitors. Thanks to a prominent citizen, Daon Wall, who owned Wall Concrete Pipe, the replica was “Texanized” in 1998. Visitors are charmed by the large red cowboy hat atop the structure, a jaunty Stetson four and a half feet high with a ten foot wide brim. On the city’s logo, the “A” in “PARIS” has been transformed into a miniature Eiffel Tower sporting the cowboy hat. There it stands, a touchstone of civic pride, in a city named for Paris, France, as a token of international good will. Coinciding with the arrival of Gifford’s Tower in Paris, Texas, events were taking place in Memphis, Tennessee, that would bring the two cities together. In 1990, the annual mid-South music festival honored France with a focus on ”All Things French.” This engendered a couple of creative ideas in a city named Paris, northeast of Memphis. Each year Christian Brothers University in Memphis honored the music festival with a structure from the theme country. Spearheaded by professor emeritus of civil engineering Tom Morrison of CBU, a near-exact model to scale was designed. His planning team included professor of mechanical engineering Jim Jacobs and Roland Raffinati, an engineering lab technician. Students in the engineering department, assisted by faculty and friends of the university, built an Eiffel Tower replica that was kept on campus for two years. Together, they had put in more than 10,000 hours of labor. Like the Gifford replica, the tower was made of wood, about 500 pieces of Douglas fir, though reinforced by 6000 steel rods. There was a problem with students climbing the structure, which couldn’t support their weight, and the faculty decided to donate it to the city of Paris. Brother Patrick O’Brien, then a public relations official at CBU, made the necessary arrangements. The tower’s new home was Memorial Park, which became the site of an annual Eiffel Tower Days celebration. By 2002 the wooden tower had started to deteriorate and was replaced by one more durable. This entailed construction of a steel structure in three sections, then trailering each section to Memorial Park. The job was done by a Paris company, Precision Grinding and Metals, owned by Keith Jackson. The 1990 music festival generated another event in that city northeast of Memphis. Identifying with its French namesake and others in America, the Paris-Henry County Chamber of Commerce brainstormed a Paris, USA Conference to which all fifteen American cities named Paris were invited to send a representative. The conference took place April 19-21, 1991, with ambassadors from five American communities and a French delegate, Monique Watson, from the French Government Tourist Office in Dallas, Texas. According to Virgil Wall, then Executive Director of the Chamber of Commerce, “It was an attempt to get good will working in the United States.” This goal was handily met. Delegates were euphoric as they were treated to Southern hospitality in the form of a giant fish fry, a boat ride, and in-home visits with community leaders. Titus and Fadel told about their Paris, traditionally a farming area, its only industry homogenous metals. A growing concern is provision of water and sewage services for new subdivisions. In this case, the town was named to honor Colonel Isaac Paris, who sent corn to starving settlers in the crop failure of 1792. From Paris, Kentucky, Chamber of Commerce Director Mollie Adkins shared the pride and problems of that enclave of 9800 persons. This city twelve miles north of Lexington is governed by a mayor, city commissioners, and county judges. She identified the main problems as loss of industry and lack of access to interstate highways. As for the origin of the town’s name in 1869, early settlers from Kentucky thought it was named for Paris, Kentucky. This is understandable because Paris, Missouri, also represented at the conference, was in fact named by Mrs. J. C. Fox for her home town of Paris, Kentucky in 1831. Another explanation, however, is that the word “Paris” was carved on a tree in the center of donated land in Kentucky. Now, in April 1991, Gibson’s tower was still standing on the campus of Paris Junior College, where Felix Gibson worked. 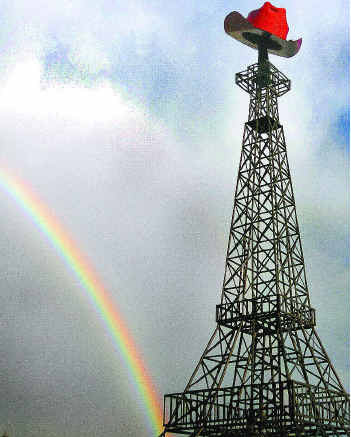 Ray Sissel remarked with pride: “There is a very well-constructed Eiffel Tower built by a gentleman who sent it to Paris, Texas, to be erected.” In fact, the Texas delegates had brought gifts – small pins with a replica of the Eiffel Tower and its cowboy hat. Thus Herb Gifford’s wooden tower was made known to the city of Paris, Tennessee. The tiny town of Paris, Missouri, population 1500, was represented by Priscella Wheelan and Marge Starett. This is Mark Twain country in the Agricultural Salt River Valley, and folks here are proud of their friendliness. A prominent citizen, Nelson Willingham, designed an elegant Eiffel Tower logo that graced official stationery for two decades. Vanessa Forrest of the Chamber of Commerce has continued the tradition with a new design. All these cities were pleased to share camaraderie, impressions, problems and ideas. An interesting coincidence is the significance of the date March 21st to Paris, Kentucky, and Paris, Texas. In Kentucky, it signifies Eternal Flame Day honoring veterans; in Texas, it recalls the destruction of the old Paris. In Texas and Tennessee, the Eiffel Tower replicas are tourist attractions, and more, appearing on the logo of official stationery and local businesses. They have been taken into the heart of the citizenry as a focus of civic pride and community activities. Eiffel Tower Days, celebrated in Tennessee each June, coincides with a Hot-Air Balloon Festival that attracts thousands of visitors from distant areas. Wanda Anderson, who directs a foreign studies program at CBU, describes the vitality of this event in and beyond one community. She says that much enthusiasm is generated, with people enjoying multicultural and children’s events and getting a chance to contribute to fundraising for local non-profit organizations. Besides encouraging civic pride and bringing American communities together, Eiffel Tower replicas foster international good will. Just as naming a city “Paris” is taken to express admiration for the French capital, and by extension the nation, these structures are an acknowledgment of the attraction of French culture. According to two young French journalists who toured the United States in 2007, most Parisians don’t realize there are towns named Paris in the United States. According to an article in the Paris Post-Intelligencer, Antoine Agasse, touring with Gilles Bouvaist, said that many French citizens think the movie, Paris, Texas, refers to the Paris in France and the state of Texas. In Paris, Tennessee, they met with city officials and of course visited the Eiffel Tower in Memorial Park. Agasse commented: “It’s pretty. It’s well done. It’s smaller, of course, but it’s very well done.” They visited four Parises in all, beginning with Kentucky, then Tennessee, Arkansas, and Texas, where they planned to see the Eiffel Towers. France, in turn, has welcomed the opportunity to respond and participate in Eiffel Tower events. A French delegate was present at the Paris USA Conference, and the Consul General of Paris, France, René-Serge Marty, was on hand for the 2002 dedication of the new all-steel structure in Tennessee. The structure was then topped with a French flag. Consul General Marty honored those who helped France throw off the yoke of German occupation in World War II, “helping him and his countrymen to be a free people.” More than twenty local veterans were presented with certificates from the French government. Later, a reception was held at Paris Civic Center. Two hundred and twenty-one years earlier the French had played a prominent role in the battle of Yorktown, winning a decisive victory for the Continental army. Fighting alongside George Washington, Lieutenant General de Rochambeau commanded a large contingent of French soldiers. Paris, Tennessee was named to honor the Marquis de Lafayette of Paris, a volunteer who led a Light Infantry Division. In fact, to this day the city confers the title of “Marquis de Paris” upon outstanding individuals. The intertwining history of two nations, at such an elemental level of freedom or its absence, is well acknowledged by representations of the Eiffel Tower in American cities. Interestingly, America’s iconic Statue of Liberty owes its framework to none other than Gustav Eiffel. In Paris, Kentucky, a beautiful highway was opened a few years ago, running sixteen miles to Lexington. With limestone fences on both sides, this highway has won awards for its design and, of course, has facilitated business in Paris. As for Herbert Gifford, who labored to build a wooden Eiffel Tower replica in the backyard of his Medford home, he eventually got to see the original in France.